If you’re looking for the perfect holiday drink to serve at a party or offer to bring to a party, look no further because Robin graciously texted me her delicious sangria recipe! So one important thing to note about this drink is that it’s very strong, but despite this, you will go back for multiple glasses. So make extra and enjoy! Mix and chill for at least an hour. Serve over ice. *Note: For a fruitier flavor, substitute ¼ cup frozen orange concentrate for the orange liqueur. What’s your drink of choice? I love good wine, sangria, and mojitos – just depends on my mood! Ohh that definitely would be a strong drink, but I love sangria! I’m totally bookmarking this recipe! Yes, strong BUT so good! Thanks for posting this!!! 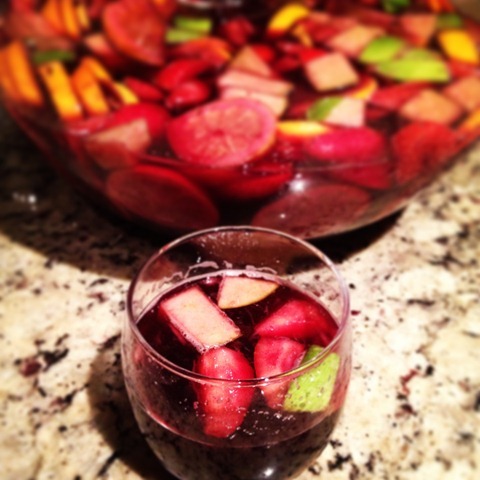 I love sangria and especially at dinner parties. If it’s not water or coffee, then my heart definitely belongs to red wine or sangria. Thanks for sharing, girl! Ahh water! I forgot about that drink of choice! Let me know if you make it and more importantly if it’s a hit! Sangrias give me the biggest headache, but I can not drink anything else when dining on tapas! My favorite drink must be Jameson and ginger ale. Tapas and sangria are like PB and jelly! Love sangria. drink of choice is definitely margaritas, mojitos, and martinis. This looks delish! We have this ‘Night Market’ here in the heart of Melbourne city which serves the BEST Sangria- so good! Have you tried Soho before? Best. Liquor. Ever. Its a lychee liquor which you mix with lemonade. Oh geebuz, I want one now. But I make my female friends get it at bars because its a strictly ladies drink. Oops. Haha! That’s awesome. I think I’ve tried Soho before – sounds familiar and delicious!